2 slots – Double pole on/off switch to isolate the incoming mains supply entering from below. 4 slots – Programmable Logic Controller (PLC) which takes 2 inputs (remote on/off via radio link and contactor status – see item #4) and generates 1 of 4 outputs (corresponding to off, 6 Amps, 10 Amps or 16 Amps). Beneath the PLC (and not visible inside the case) sits a circuit board with an array of resistors corresponding to the required current settings. 2 slots – Protocol controller which handles the Mode 3 handshake with the car and switches between current settings based on the selected resistor. 1 slot – Contactor which turns the power to the vehicle on/off based on the output from the protocol controller. Cable to car exits below. 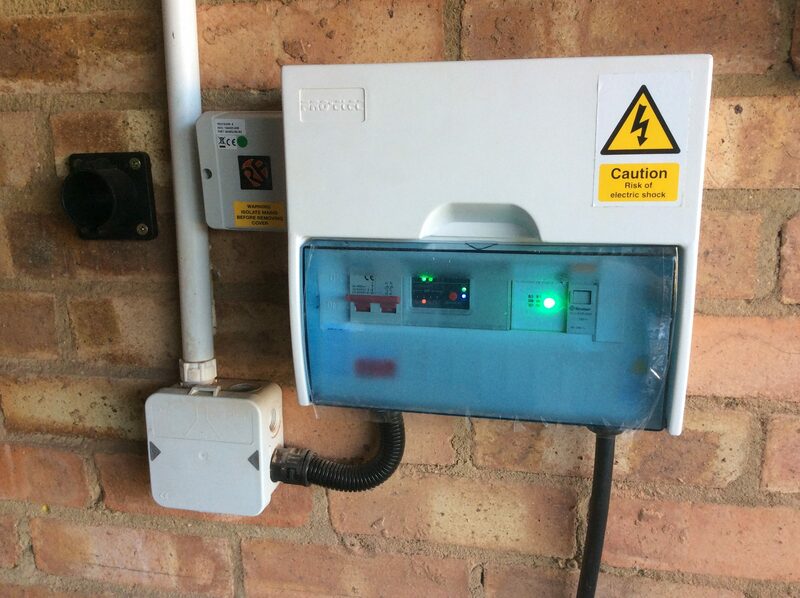 The dedicated charger circuit is fed from a RCBO in a small consumer unit on the other side of the garage which combines overcurrent protection (20 Amps) and Type A residual current detection (30 mA). This entry was posted in Charger control project on 24/08/2017 by Greening Me. Today I was at home working on a DIY project while the car was on charge for much of the day, a day which was fairly mixed in weather terms. I thought it would be appropriate for an update on the car charger which has been in operation for around a year. You may recall that the car generally remains plugged into the charger whenever it is at home, but doesn’t generally charge until there’s sufficient surplus on the solar panels, unless timed charging has been enabled for when the weather isn’t so sunny. 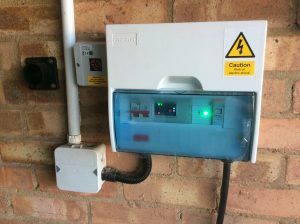 The picture shows the charger itself built into a case intended for a consumer unit. Alongside the charger sits the receiver for the Mainslink system which provides for a radio signal from the house turning on the charger in the garage. The smaller black unit is the holster for the vehicle connector so that it doesn’t lie on the floor when not in use. The screenshot to the left shows the electricity consumption of the house including the car charger (the purple line) tracking the output of the solar panels (the green area). Any failure to fully use all the electricity available causes the remaining electrical surplus to be diverted via a proportional control to the immersion heater to make hot water (the blue line). 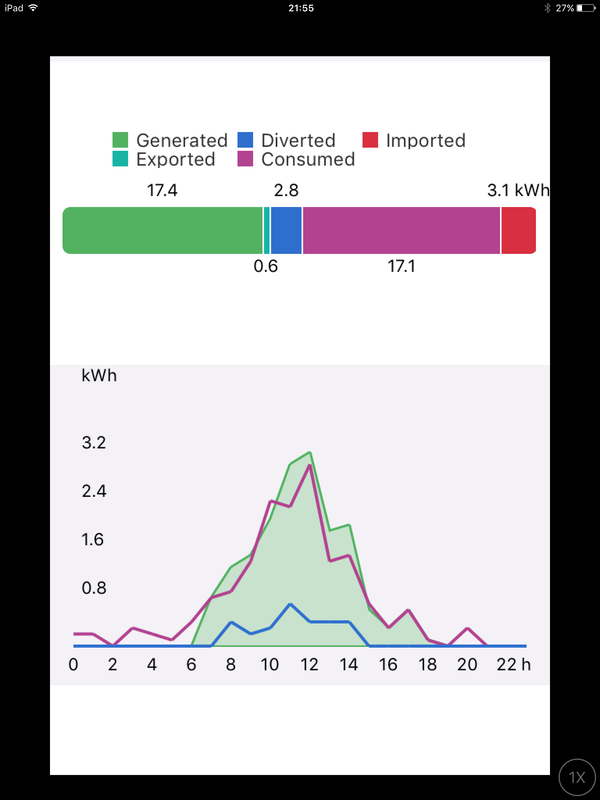 Over the course of the day although we’ve used 17.1 kWh of electricity directly, and another 2.8 kWh of electricity for water heating (making 19.9 kWh used in total); but we’ve bought only 3.1 kWh of electricity. This entry was posted in Charger control project on 18/08/2017 by Greening Me.